I'm sure that my lovely three followers have been wondering where I'm at ???? I'm here....I have had so much going on the last few weeks that the thought of even sitting down and writing hasn't even crossed my mind. I've had weddings, wedding showers, baby showers, and work. But this weekend I finally have a FREE weekend.....well almost free.....LOL. I'm playing "mommy" to my niece for the next couple of days since her mom is out of town for work. I'm up for the challenge but before all that fun begins I get to have girls night with some of my favorite girls...Kathleen, Kevana, and Melissa. Kathleen has graciously offered up her culinary skills tonight. I can't wait to see what's on the menu. Saturday I plan on taking my niece to Monkey Joe's for our morning workout and then catching a movie with one of my girlfriends for her 30th birthday. 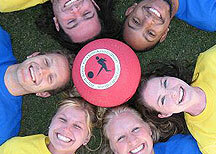 And SUNDAY it's KICKBALL DAY!!!!!!! I know I'm in my young 30's but kickball still excites me. I love the fellowship with my teammates and the exercise.......they only bad thing is that it's supposed to be 96 degrees out. YIKES!!!! Maybe someone will have a pool party afterwards so we can cool off. Do you guys have anything fun planned for the weekend?